I was having problems with my subscriptions, whereby their recent video uploads were not all showing in the New Subscription Videos sections of the plugin. Apparently this seems to be a problem on YouTubes side, which YT isn't properly updating it's API to show all the latest uploads for the subscriptions. Though, there is a fix for this. 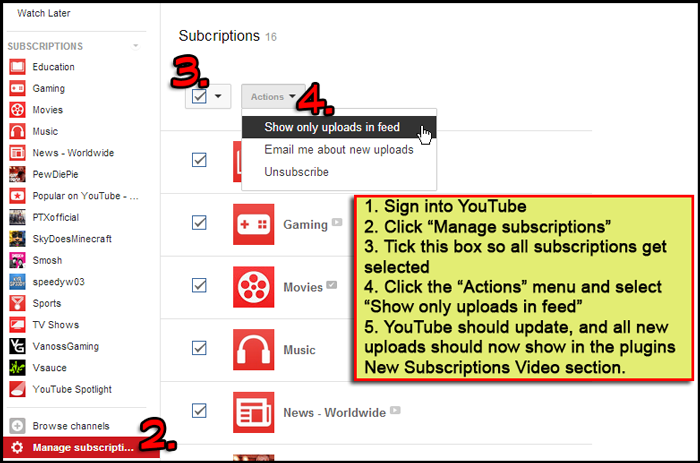 I posted below, a step by step pic, that shows how to get YouTube to start properly updating all the new subscription video uploads. If you're having this same problem, give it a try, and hopefully its fixes the problem. Thanks geez Youtube/Google+ is a PITA. The updating the username and flushing the xml works for me...at least until next time. Having to remember a separate account is pretty annoying though. Worked for me on Windows....although downloads still don't work (stuck forever on "preparing download"). Anyone have a solution to get downloads working again? I recently started to experience that videos starts to buffer a lot. Mostly after 3 PM. Running OpenELEC 3.2.4. Anyone else with a similar experience? (2013-12-04, 22:20)MindTooth Wrote: [ -> ] Mostly after 3 PM. Maybe kids are home from school and jumping on their computers and sucking up network bandwidth? I have a 25 Mbit/s connection. The 3 PM referance were not just. Not sure it's really the issue. But who knows. Live in a community of only 2000 people. Viewing via my Mac works just fine. How get play Youtube videos in 1080p. I had a problem with my router, so I reset it. But since that point the YT app doesn't want to connect (log in error). My Google+ is not linked and I don't make comments on YT videos at the moment because I don't want to link accounts because it breaks the app. Do you need to see a log? I tried to use my YouTube ID which is a set of letters and numbers I hadn't seen until now. I hope someone can shed some light. I´m new to the Raspberry Pi and xbmc. I´m trying to setup the plugin on a Raspberry Pi running Xbian beta 2 and continue to get an error message. I followed "quaternio" instructions to attach my youtube account to a g+ page and setup a password for it. However I still get an error. Am I right in thinking that it´s getting text in spanish and getting mixed up with the accent mark. I have the default setup on the OS (haven´t changed anything). Is this due to the country I´m in (Spain)? Can I work around it? Below is the debug log. I have changed the password as it was in plain text. I also use Google 2 step verification (so that I can use YouTube on my mobile phone) - and this is the point at which my login fails. I definitely don't have the google plus issue - and a 2 sv code is definitely sent to my phone. It's just that when I enter it, the plugin fails. This works, thank you so much. I've reinstalled EVERYTHING in my PI - created new partitions for both system and storage and reinstalled openelec. The first thing I did was to install the youtube addon and after it finished downloading I got an error regarding missing common (something... don't remember the rest of the name but I'm sure it has something to do with commonfunctions). 00:15:57 T:2894263392 NOTICE: Previous line repeats 2 times. 00:16:01 T:2848978016 NOTICE: Previous line repeats 1 times. 00:16:02 T:2928014432 ERROR: DeleteFile - cant delete file </storage/.xbmc/addons/packages/plugin.video.youtube-4.4.6.zip>. trying lower case </storage/.xbmc/addons/packages/plugin.video.youtube-4.4.6.zip>"